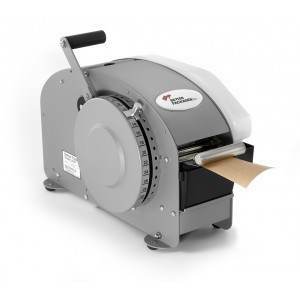 The BP333 is a rugged, reliable, simple-to-use manual water-activated tape dispenser. The BP333 has 15 preset tape lengths measured in inches on a dial. This model includes a top heater accessory and it required electricity. With the addition of heat, the water in the reservoir is not only warmed faster but optimizes the tapes adhesive properties. ← Back to "Water-Activated Tape Dispensers "
Dimensions 21" x 10 1/2" x 9 1/2"
Maximum Diameter Of Tape Roll 7.5"
Preset Tape Length up to 30"